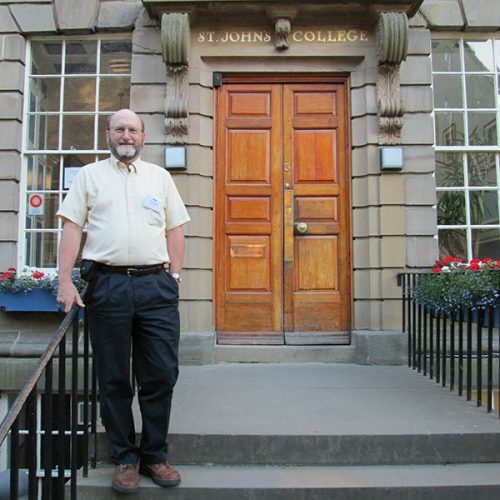 Associate Professor of Philosophy Paul Jeffries attended the 12th annual conference of the International Society of MacIntyrean Enquiry (ISME) held at St. John’s College at Durham University in Durham, England in July 2018. The four day conference focused on the work of Alasdair MacIntyre, one of the most distinguished moral philosophers of the late 20th and 21st centuries. This year’s conference theme was on MacIntyre’s contributions to learning both inside academia and beyond. Jeffries gave the presentation “A Conceptual Swiss Army Knife: MacIntyrean Enquiry in the Liberal Arts College,” examining the use of MacIntyre’s theoretical commitments in the context of a liberal arts college. He explored the ways MacIntyre’s analysis informs his work as a scholar and teacher of philosophy, as a member of interdisciplinary programs at Ripon, and as a faculty member working in a broad institutional context of faculty policy and shared governance. An overview of the conference, including some comments by Jeffries, can be viewed in this presentation prepared by Dr. Plamena Pehlivanova. Posted October 17, 2018 in Faculty by Jaye Alderson.